It has been just over a week since the Eastern Prairies suffered one of its worst storms in modern history. Mercifully, the weather has improved immensely since, with sun and heat gracing us in most of the days following the torrential rainfall. Many of our crops have recovered fairly well, or as well as can be expected, with some faring better than others. Some plants just have a greater ability to withstand severe weather better than others. Cereals, like wheat and durum, still look excellent, despite some lost acres that are still underwater. 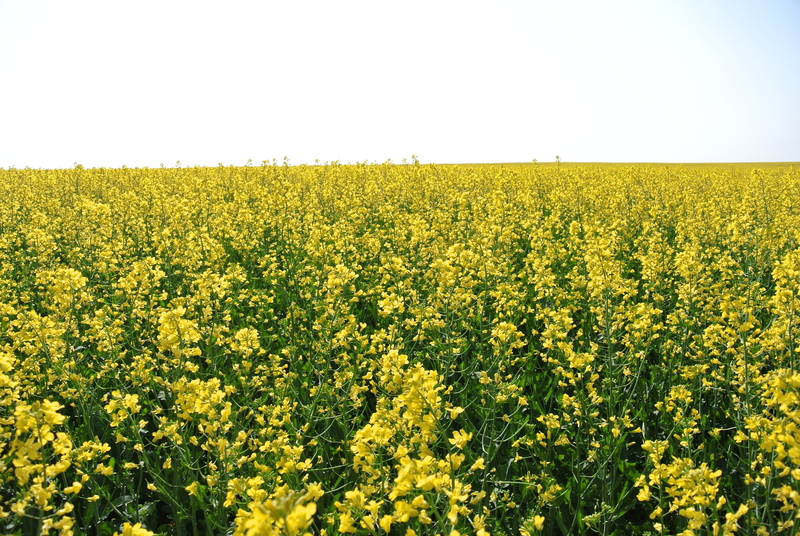 Our canola has come a long way, but its yield potential is very much a question mark. 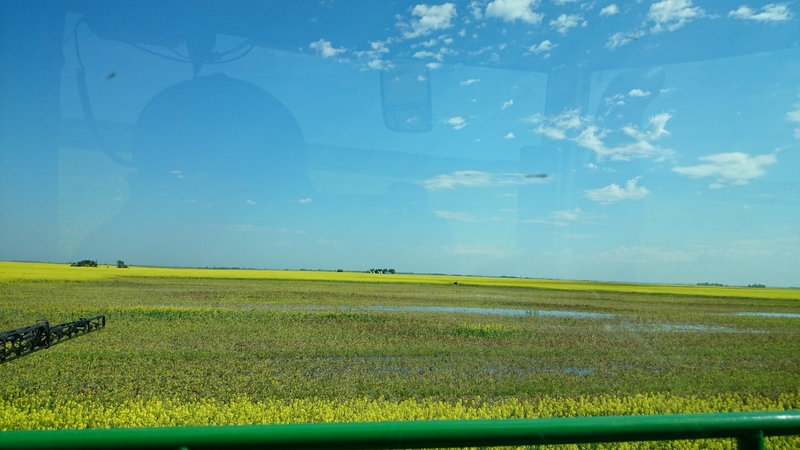 Other crops, like our lentils and peas, look quite poor, with a substantial amount of acres flooded out completely, and many other acres with weak yield potential. We finally were able to complete our in-crop weed control a few days ago with our flax, which is still frustratingly wet. After nearly a week of hot, dry weather, I guess I kind of expected an improvement in the sogginess of our fields. I was unpleasantly surprised, with the sprayer leaving ruts far away from where the water lay. As we now move through some of our crops again with a fungicide, it is still shocking how many acres are lost. Why do plants die from too much water? Roots cannot access oxygen. While leaves usually have lots of oxygen available from CO2, roots must access it from the soil. Little air pockets in the soil allow roots to “breathe”, but if water has filled all the air pockets, the plant can’t breathe, essentially drowning it. While the plant has some coping mechanisms, they are not overly efficient, and it will eventually be overcome by its inability to access oxygen. The root cells will die, slowly killing the entire root system; without the roots, the plant will die. Since the soil is saturated with water, the plant cannot access the nutrients it needs for life, causing it to starve (more or less). Combined with root death, the plant has no chance to survive. 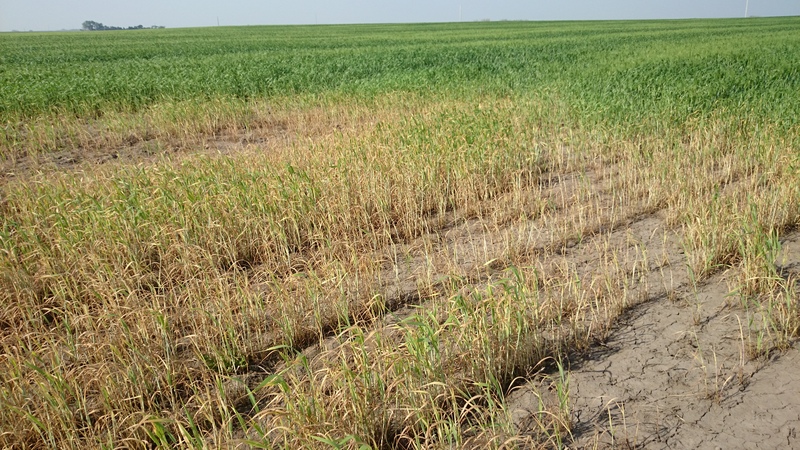 If the water can leave relatively quickly, say two days or so, the plant will usually recover, as many of them did. But for all too many plants, the water stayed around for far too long. Not a pretty sight to see, but there are a lot of these spots. At this point in the growing season, we know that a certain amount of production is gone, never to come back. We have probably lost 10-15% of our acres from waterlogging so far, which, when you start to do the math on how much production that can be, is a substantial amount of money. The pressure is even greater now for the remaining acres to yield well, even just to make up for the lost acres. At least we won’t need to worry about drought now… right? It pains me to say this even more than it probably irritates you to read it, but despite all of the ridiculous rainfall we’ve gotten this year, and despite all the problems it has caused, sometime, in the next week or two, we will… need some rain. I know! I’ve spend the last two months complaining about too much rain, and flooding, and waterlogging, and everything that goes with it, but it is a sad fact of farming that crops need moisture every few weeks, regardless of how much they had previously. All of that horrendous torrential downpour we dealt with almost two weeks ago basically just ran off, filled up low spots, and killed crop. Since the soil was already full, it simply couldn’t take it any more, and the crop was pretty much unable to use any of it. Since then, we have had nothing but sun and heat, which has been perfect; but, with that comes a net drying of the soil. Soil probes that measure moisture in the ground recorded that canola in the flowering stage of its life uses close to 9 mm (that’s 3.5 tenths) of water per day! It doesn’t take long to empty 3 inches of water out of the soil then, does it? This monster devours a lot of water! Yes, I’m afraid that weather just isn’t really ever perfect for farmers, and we can always find something wrong with it! Don’t be too hard on us, though; remember, with 10-15% of our crop now gone, and much of the rest of it coming out of severe stress, we need all the yield we can get out of what we’ve got left out there. We will need all that we can get to make sure we can get our bills paid and hopefully have a chance to try this farming thing again next year (why? I am starting to wonder!). As we move deeper into summer, our crops are slowly advancing into their reproductive stages. This is a critical time of the year, when a rain at the right time can be worth a fortune. The flip side of that is that rain at this time of the year often brings hail, which can be devastating to crops at this stage of their lives. It may be soon to be thinking about it already, but there is one possibility that looms like a black cloud over all of the hopes we have left for the crop this year. With such a cold and rainy May and June, crops are woefully far behind normal. While we got away with that last year despite our fears, every year is different, and luck can change awfully quickly. The thought of an August or even an early September frost is terrifying. It would devastate many of us. For now, all we can do is monitor our crops for insects and disease and hope for the best. 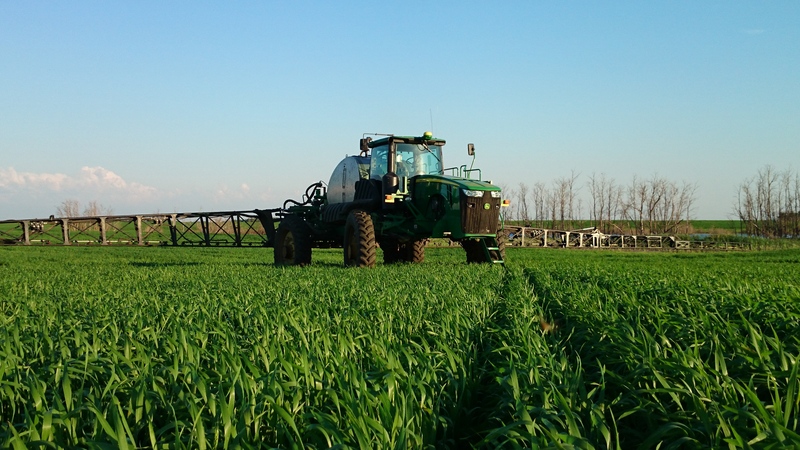 We have to do everything we can to ensure no pests take away what we have left out in the field, and that means carefully watching for disease, weeds and insects, and spraying for them if and when it is necessary. These are simply to finish the crop; there is nothing we can do now to hasten our crops’ maturity. That ship sailed after seeding was completed. It is in Mother Nature’s sometimes kind, but oftentimes wicked hands what happens to our crops now. I don’t know what the crops’ abilities are to recover from such a hellish spring, but I do know one thing for certain: the success or failure of the crop is now out of my hands. It’s all about the weather now.